So it turns out that if you have a closed plastic bag of Hershey chocolate minis in a small compartment at the bottom of an 80 pound suitcase full of craft supplies locked in the camper shell of your truck in Tahoe, a bear will know. Wandering by, late at night, he will smell chocolate, gingerly ease your locked camper shell door open and pull your 80 pound suitcase out without disturbing anything else inside. Then, with surgical precision, he will tear through the suit case right above the spot where the chocolates are located. Tossing aside the stupid box of colored pencils he encounters firs. He will carefully tear another hole through to the next compartment until he gets to his chocolates. Once he has them, will he rip the bag into a thousand pieces like an uncivilized animal? Nope, the bag will stay completely intact but all the chocolates will be devoured. 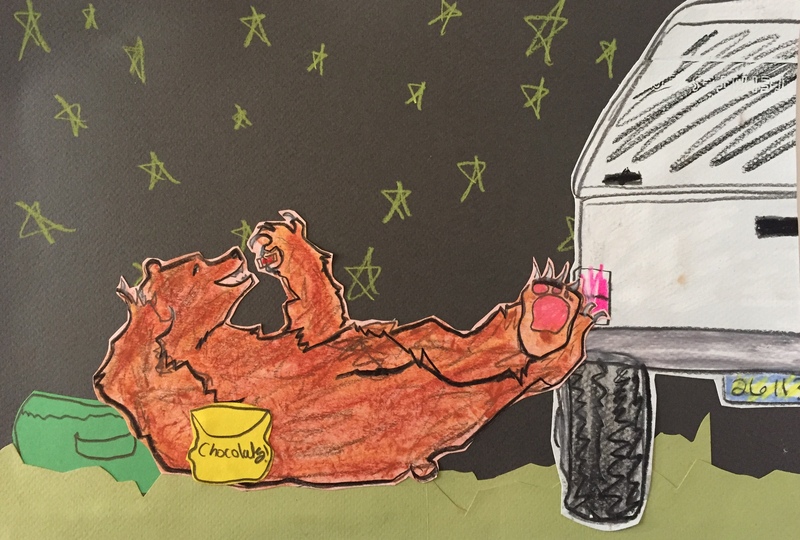 Here’s my artist’s rendering of the bear enjoying his precious sweets.